Understanding is one of the most important things when learning to code. And it’s not the easiest — sometimes you just want to bang your head against the wall. That’s what happened to me when I started to learn Django. 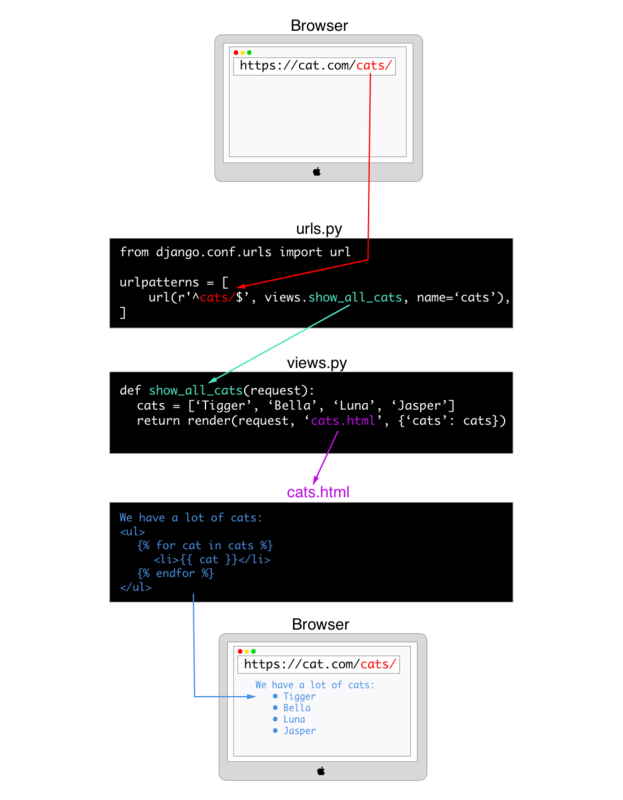 Here I want to show you what urls.py and views.py are for, and how they help a simple URL to become a full web page. Say we open https://cats.com/cats/ in our browser. First thing, Django drops the domain from the URL and we are left with cats/. Then Django goes through the URL patterns in urls.py (aka the URL rule list) in an attempt to find a rule that would match. And it finds one. It’s a rule with name='cats'. According to this rule, Django knows which view must be used to handle a request - it’s views.show_all_cats. Django calls the show_all_cats function (which comes from views.py). Which in turn renders the cats.html template. And finally, we are full of love for the beautiful purr-y creatures.